This article will be general in nature. If you want to learn more specific things for NX Nastran (and Femap to a certain degree) – read the full “geek version” here. This is the first type of material nonlinearity. It is dedicated only to isotropic materials. 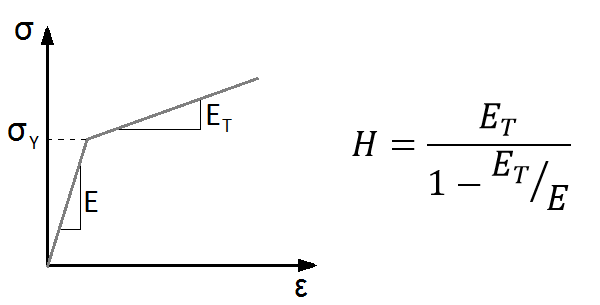 A nonlinear elastic material will not yield, which means that however high the load will be, after taking that load away the material will return to initial state without any permanent deformations. It also does not show strain hardening (after several times of loading – unloading cycles it acts the same). To define it you should make a stress vs strain function (in Femap it is called Function Dependence). This function can be defined for first and third quadrant (positive stress + positive strain and negative stress + negative strain) – this takes into account that material may exhibit different properties in compression. If you define the function only in the first quadrant the first point must be at 0.0 point. It will be assumed that the relation in tension and compression are the same, but some codes may actually require you to define both even if they are symmetric. If you are using Femap please note that you should use a chart 4.. vs Stress when you are defining the nonlinear property (there is also a stress vs strain function). This is the more advanced option than bilinear material described previously. A lot of settings remain the same (yield criterion, hardening rule, initial yield point). Instead of work hardening slope H you have to define a curve showing the multilinear relation between stress and strain. where is a plastic strain in point k.
Firstly, many thanks for the interesting articles. It’s great to see a practicing FE user’s take on how to build trustworthy models. There’s very little out there to bridge to gap between FEA classes and real world use. I think there’s something up with the notation in the Multi-linear plastic material section as there is no (ε1; 2c) point in the diagram. Is there a case where the rigid plastic material model is the best choice? I haven’t seen this model before. 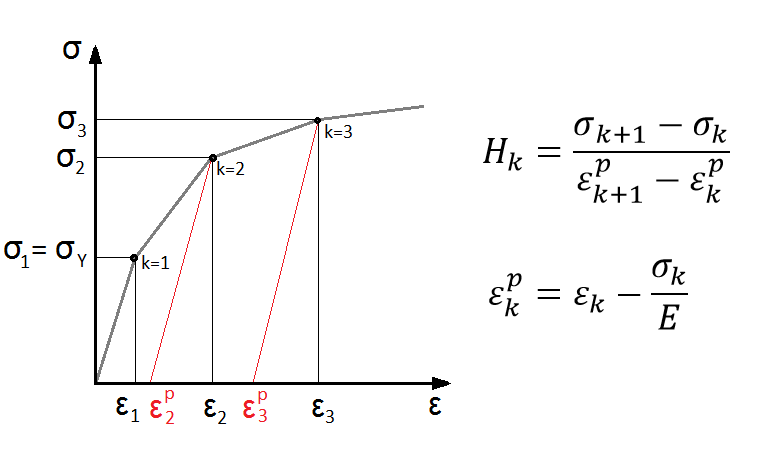 The diagram is made for von Misses yield criterion, if you would use a Mohr – Coulomb or Drucker – Prager models there is no “yeild stress” in those. Instead a 2c (twice the cohesion) is used. Another great read from yourself! 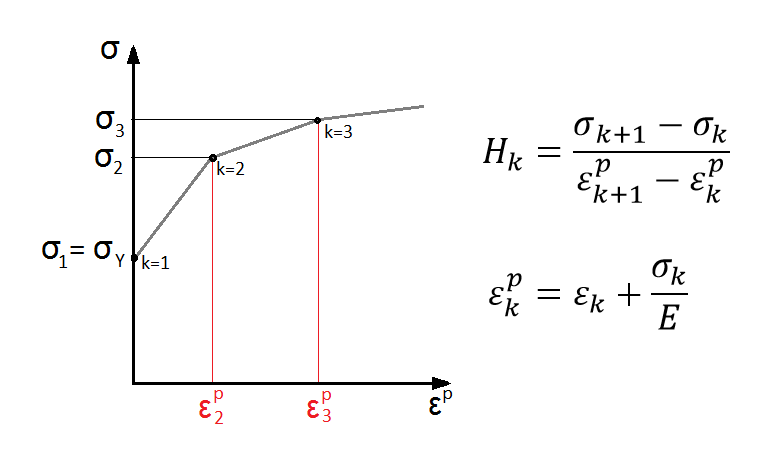 I am trying to set-up bi-linear elastic-plastic material in my software (MIDAS FEA) and in this particular piece of software, it is require to define graph of Plastic Strains / Yield Stress for Von Misses criterion (so I guess, depending on how many points on graph I define this can be bi-linear or multi-linear model). There is no option to change to hardening slope or at least total strain. I was looking through net but cannot find this data for any steel grade (I mean plastic strain-stress function). Could you maybe point me to right direction where I can get this kind of data?